More snowfall across parts of the UK has brought fresh travel disruption and school closures to thousands. 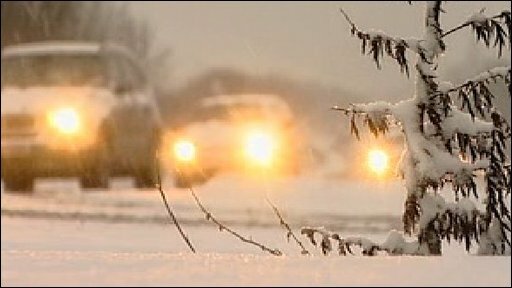 There are several severe weather warnings in place and councils say they are running low on gritting salt. 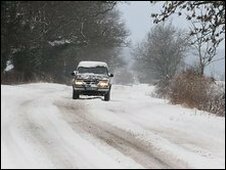 The AA warned shortages of salt have created a "road safety crisis", but the government said it was difficult to prepare for such unusual weather. The M4, M5 and M1 have been badly affected and hundreds of schools have been forced to close their doors. The Met Office has issued a number of severe weather warnings for heavy snow in much of southern and central England, Scotland and Northern Ireland. Some 20cm (7.9in) of snow has been reported in parts of the Cotswolds and Aberdeenshire. Matt Taylor of the BBC Weather Centre said the snowy weather would start to ease for much of the UK through the night but with widespread icy conditions developing. By Friday morning, parts of central and southern England would receive the next heavy snowfall, he added. Some councils have just three days' worth of grit left after supplies were "massively" depleted by the heavy snow, the Local Government Association (LGA) admitted. Worcestershire County Council is not gritting roads but sending out snow ploughs. 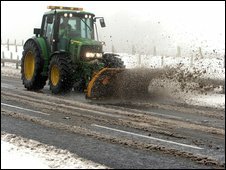 Country Councils in Warwickshire, Wiltshire, Gloucestershire and Ceredigion as well as Swindon borough council have confirmed that they are running low on salt and are only salting main routes. Hertfordshire County Council said it was seeking additional supplies from abroad, while Cumbria County Council said it could over-spend its winter maintenance budget by £1.3m. Derek Turner, Director of Networks Operations at the Highways Agency, said it had "three, four days of salt supplies remaining". Paul Bettison of the LGA told the BBC's Today programme that the UK should look to importing fresh supplies of salt. "That requires government to actually work with us all, and then we can do it as one - rather than, as we've seen, having this scrapping for what limited supplies are available." AA President Edmund King called on the government to co-ordinate the situation and ensure salt stocks were maintained so that Britain's roads did not become "death traps". Rosie Cooper, the Labour MP for Lancashire West, said preparations had been "woefully inadequate" and accused councils of gritting fewer roads each year. But Transport Secretary Geoff Hoon said storing snow ploughs and extra gritting salt would be expensive, when the snowy weather is so unusual. A spokesman for the Highways Agency has advised drivers to take extreme care and not to travel in the worst affected areas unless it is essential. The Great Western Ambulance Service has brought in 4x4 vehicles to try to maintain their services. The East of England Ambulance Service has asked people to call 999 only in an emergency. The runways at Aberdeen, Luton, and Robin Hood International airports have been closed. Birmingham, East Midlands, Cardiff Wales and George Best Belfast City airports have reopened, but flights have been delayed. At Luton, check-in has been suspended and flights are subject to delay and cancellation. Bristol Airport is open but experiencing delays. Thousands of pupils have had another day off as schools across the UK closed their doors on Thursday. Some 623 in Wales have shut, while other closures have been reported in Aberdeenshire, Moray, Birmingham, Bedfordshire, Buckinghamshire, Cambridgeshire, Sheffield, Rotherham, Coventry, Warwickshire, Hertfordshire, and Oxfordshire. Devon, Bristol, Shropshire, Somerset, Lincolnshire, Leicestershire, Northamptonshire, Solihull, Worcestershire, Herefordshire, Staffordshire, Cheshire and Norfolk have also reported school closures. A walker has died after falling over 100 feet in icy conditions in the Lake District. Two missing climbers in the Cairngorms have been found safe and well. The two men - thought to be from the Inverness area and aged 22 and 29 - were spotted by a rescue helicopter from RAF Kinloss and have been flown to safety. Why is snow so bad for potholes? Is farming coping with the snow? Why is it so cold this winter? Fuel bills - what help is there?